Our 14 acre farm and greenhouses are located in Monroe, NC, 30 miles south of downtown Charlotte. We have preserved and nurtured this farmland organically since 1978. Ray and Mary Roberts Tarlton are co-owners and managers of Windcrest Farm and Final Touch Construction Services. After twenty years as a corporate instructor and project manager, Mary used her passion for growing plants organically into a business that supplies market farmers and home gardeners with over 250,000 heirloom vegetable, flower and herb plants each year. In addition to growing hard-to-find plant varieties, Mary also conducts on-farm classes to help beginning farmers and gardeners learn the principles and practices of sustainable agriculture. 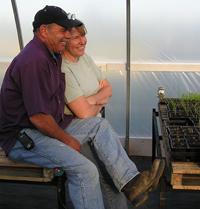 Ray Tarlton is a NC/SC General Contractor, ace greenhouse builder, and our on-farm "MacGyver".